Chunky yet attractive, the RPM 9.1's simple form and freestanding motor lend it a purity of design that makes other turntables seem fussy. 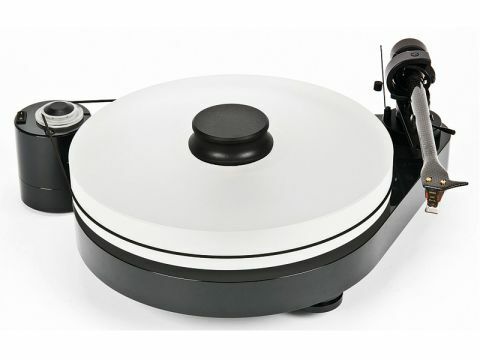 The penultimate model in Pro-Ject's range of nine inch tonearm turntables, it's available in two variants: the gloss graphite version tested here and an acrylic plinth model which has an 'X' suffix. It's pitched at a level where distributor Henley Designs considers it likely that potential customers will have an idea of what cartridge they might like to use – and, therefore comes without a needle. However, if you choose an Ortofon cartridge at the time of purchase, there is a 25 per cent discount to be savoured. There is no suspension, but the three feet are made from aluminium cones with a Sorbothane layer between foot and plinth, offering a decent degree of vibration damping similar to VPI's approach. The plinth itself is a 38mm slab of MDF with a dark grey, gloss finish. It supports an inverted main bearing which has a ceramic thrust pad and the Pro-Ject 9cc carbon-fibre tonearm. The platter is driven by a freestanding motor that sits on top of a heavyweight base. A spacer is supplied so that you know how far away to place the motor. This spacing affects the fine balance between transmitting enough energy to start the platter and minimising the amount of motor vibration that gets into it. The platter itself is also 38mm thick and comes with a heavy brass puck that simply sits atop the vinyl, making changing records a lot quicker than with threaded clamps. The 9cc tonearm is a curious amalgam of old and new technologies, a beautiful woven carbon-fibre arm tube allied to a thread and weight anti-skate system and a decoupled/flimsy counterweight. Our only gripe is that the finger lift is tiny and easy to drop when attempting to put the arm in its clip. One typical Pro-Ject bonus is that it's easy to upgrade the arm cable with an interconnect of your choice. This Pro-Ject is a capable turntable and certainly one that appealed to several of our listeners. Admittedly, it was the final presentation of the day, but the consistency of comments suggests that performance is the most persuasive factor here. As with previous designs from Pro-Ject, the RPM 9.1 is a smooth operator. Some felt that it might be a little bit too smooth and that it doesn't seem to commit as a result, but the more vinyl that was played, the less this seemed to be an issue. A key characteristic is a strong sense of drive that results in good timing and the sense of engagement with the music that this brings. There is also insufficient image depth and little in the way of three-dimensionality. Another factor is that, while generally neutral, the turntable enhances certain instruments – like the electric guitar on Steely Dan's Peg – which might indicate a midrange bump in the response. A smooth, yet engaging sound is what most people demand from their vinyl playback, and its hard to argue with the Pro-Ject's compelling style. It's not the most dynamic or revealing turntable, but it does certainly reel you in and keep you listening.